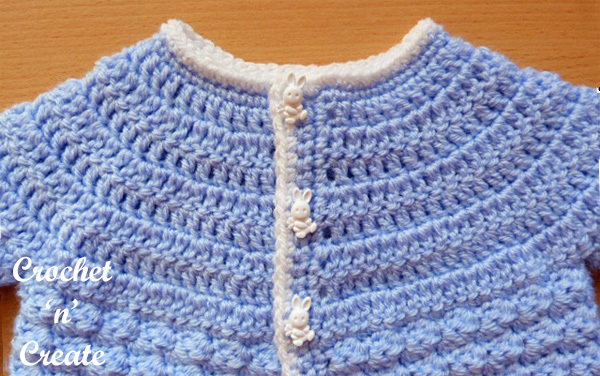 The sample was made in King Cole baby Big Value DK yarn in — colors Sky and White. 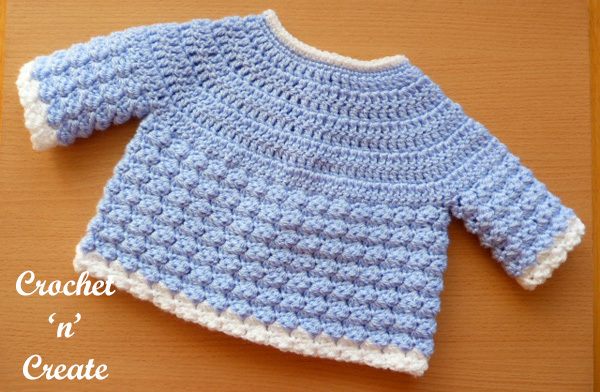 See more of my Baby Crochet Patterns. Textured Group. (1sc, 1hdc, 1dc) in same space or stitch. COAT – Worked in one piece starting with yoke. With color 1 ch49, (RS) 1dc in 4th ch from hook, 1dc in each ch to end (46dc + ch3). Turn. Row 2 – (Inc Row) ch3, 1dc in each of next 2dc, * 2dc in next dc, 1dc in each of next 3dc, * rpt from * to * to end, working last dc in top of ch3, (57dc + ch3). Turn. Row 3 – ch3, 1dc in each dc to end, 1dc in top of ch3. Turn. Row 5 – Rpt Row 3. Turn. Row 6 – (Inc Row) ch3, 1dc in next dc, * 2dc in next dc, 1dc in next 2dc * rpt from * to * to end, working last dc in top of ch3 (101dc + ch3). Turn. Row 7 – Rpt Row 3. Turn. Row 8 – (Inc Row) ch3, 1dc in each of next 2dc, * 2dc in next dc, 1dc in next 2dc * rpt from * to * to end working last dc in top of ch3 (134dc + ch3). Turn. 11th Row – ch1, (1sc, 1hdc, 1dc) in base of ch1, * skip 2st, (1sc, 1hdc, 1dc) in next sc, * rpt from * to * to last 3st, skip 2st, 1sc in last st. Turn. Rpt 11th Row until 13 rows have been worked from yoke or work measures approx 8 Inches from shoulder. Fasten off. Join in color 2 and rpt 11th Row twice. Fasten off. Pattern Row – ch1, (1sc, 1hdc, 1dc) in base of ch1, * skip 2st, (1sc, 1hdc, 1dc) in next sc, * rpt from * to * to last 2st, skip 2st, sl st to first sc on beginning of row. Turn. Rpt Pattern Row until 9 rows have been worked from yoke or the underarm seam measures approx 3 Inches. Fasten off. Button/Buttonhole Bands – With RS facing join color 1 to lower edge of right hand side front edge, ch1, 1sc in base of ch1, work 31 more sc evenly in row ends along to corner, 3sc in corner, 1sc in each ch around neck, 3sc in corner, 32sc evenly in row ends down second front edge. Turn. Next Row – ch1, 1sc in base of ch1, 1sc in each of next 17sc, * ch2, skip 1sc, 1sc in each of next 6sc, * rpt from * to * once, ch2, skip 1sc, 1sc in last sc. Fasten off. (3 Buttonholes made). Buttonhole Row – Return to first front edge, WS facing and color 1, starting from the neck and working downwards, ch1, 1sc in base of ch1, 1sc in each sc to end. Fasten off. Turn. With RS facing and color 2, start with ch1, 1sc in base of ch1, work 1sc in each sc up first front edge, 3sc in corner, 1sc in each sc around neck, 3sc in corner, 1sc in each sc and ch2 space down the second front edge. Fasten off. Finishing – Close small gap underarms, weave in and trim off all loose ends of yarn. 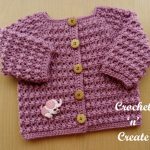 The written instructions and the pictures for this free baby crochet pattern tommys jacket are copyrighted to crochet ‘n’ create © 2018. 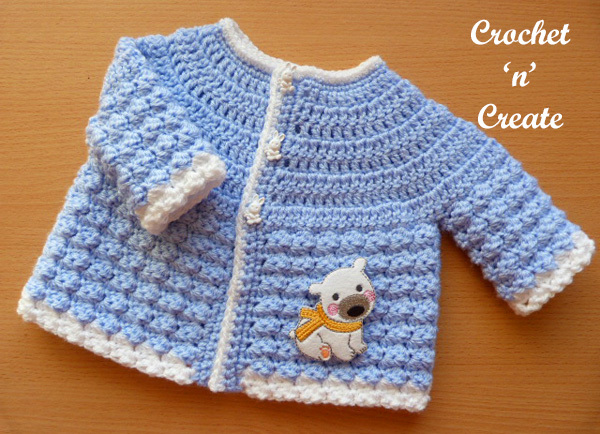 You are welcome to sell the finished products made from the free baby crochet pattern tommys jacket, I just ask that you please use your own pictures and put a link back to crochet ‘n’ create. 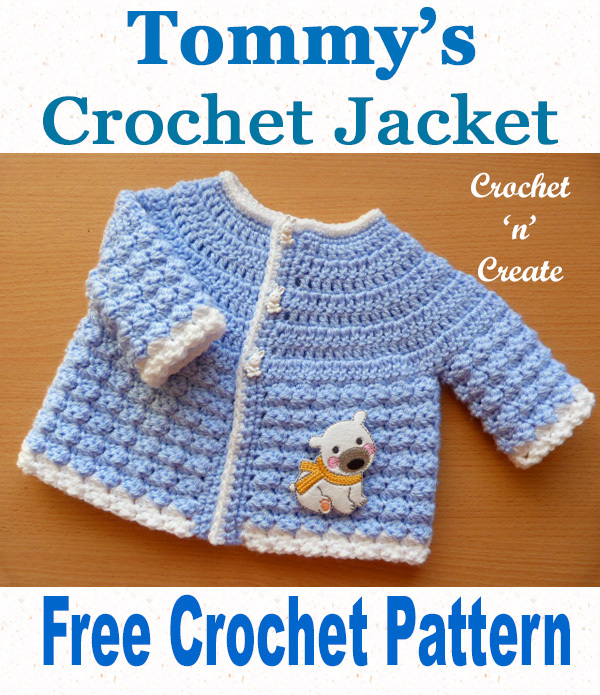 DO NOT share the written instructions for this free baby crochet — pattern tommys jacket.